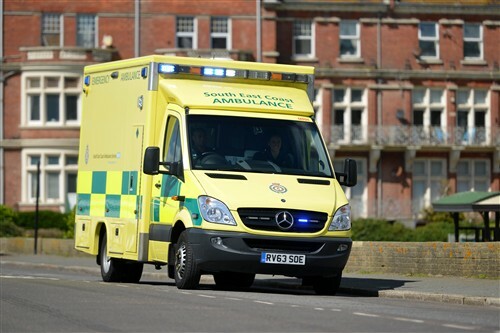 A cyclist who was hit by a car in Ramsgate yesterday (February 11) suffered a head injury. Kent Police was called at 3.40pm to collision on Margate Road, near the Hare and Hounds crossroads. Police and the South East Coast Ambulance Service attended the scene where the cyclist was treated for injuries. A South East Coast Ambulance service spokesman said: “We received a call to reports of a collision involving a cyclist on the junction of Newington Road and Northwood Road. The injuries are not said to be life-threatening. I hope the victim of the incident is ok and has enough money on them to make their way back from Ashford after treatment. We have a perfectly good hospital, the QEQM on the same road as the accident but patients are being taken over an hour away to the William Harvey. It’s ridiculous. A possible explanation is that although QEQM is nearer, there might have been long delays in A&E; although WH is further away, the guy would be treated sooner. Went past the accident on school run. I was praying he was okay and my prayers were answered. That is all I wanted to know. Hopefully, he was wearing a helmet, and that lessened the injuries due to the impact. A relative of mine used to work in the ICU at the London Hospital. He told me they often had helmet wearing casualties in A&E. The ones without helmets, he said, were in the morgue. A similar incident happened to my son. He was taken to the William Harvey and the reason the ambulance crew gave is because they have specialists in head injuries there so if further treatment is needed they can get it quickly.